Fozzie, the Scottsdale Crisis Response Dog died last month. 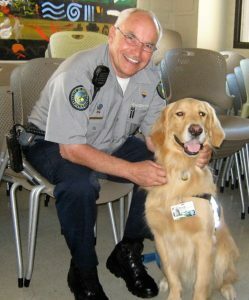 This golden retriever responded to all kinds of crimes providing comfort to people suffering from psychological trauma. From homicides to school shootings and everything in between, Fozzie was there ready to help. His big brown eyes and wagging tail were simply irresistible! Animal-assisted therapy came about after studies showed that spending time with animals decrease blood pressure, heart rate, cholesterol and triglyceride levels in humans. According to his bio, Fozzie was the first full-time crisis response dog in America. He was trained by Paws With A Cause and donated to the Scottsdale Police Department where he worked for ten years. 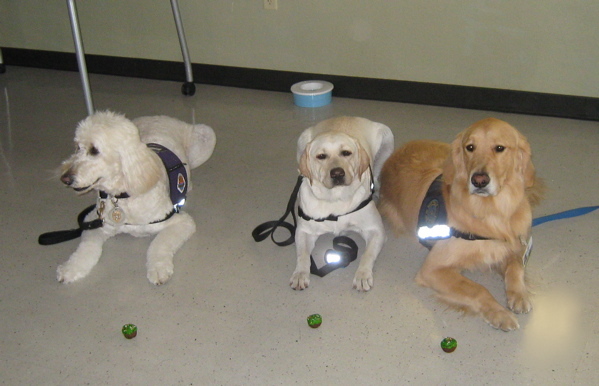 Service dogs are also being used in airports, courtrooms, schools, libraries, hospitals and with our military to reduce stress. 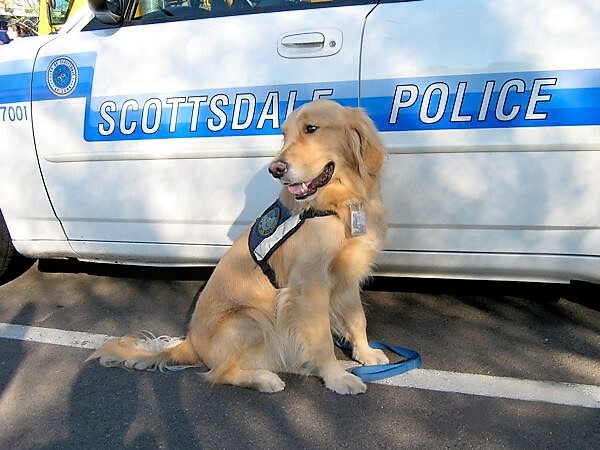 Fozzie will be greatly missed by many citizens and officers of the Scottsdale Police Department. He lived life to the fullest bringing his own special furry love to all he met. Rest in peace Fozzie. -Friedmann, E. et al, Social Interaction & Blood Pressure: Influence of Animal Companions. J of Nervous and Mental Disease 17 (8): 461-465. -Morse, Samantha. 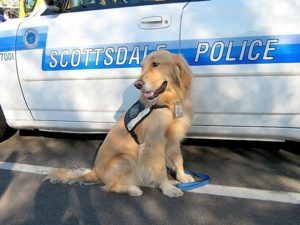 ‘Scottsdale POlice bid farewell to beloved 10-year veteran, Fozzie’, SCOTTSDALE INDEPENDENT, November 2017. -Seigel J.M., Stressful Life Events and Use of Physician Services Among the Elderly: The Moderating Role of Pet Ownership. J. Person Soc Psych 1990; 1081-1086. -Serpell, J.A. Evidence for long term effects of pet ownership on human health, Pets, Benefits and Practice, Waltham Symposium 20, April 19, 1990.